Science is another weak subject for Cameron so when we were recently asked to review Fascinating Education and their Fascinating Chemistry program, I jumped at the chance. We received access to their chemistry program for a year. It is all online so you don’t have to worry about downloading anything to your computer. They also have Biology and Physics too. It works on both a MAC and PC, not to sure about a mobile device with the videos and all. This is the lesson on heat. There are 2 different ways to learn and then there is the test. The first way is the “Lesson”, this is where they watch a video on the lessons and then take some pre-tests at the end, in case they are visual learners. The second way is the “Script”, this is where they read actually what the videos were saying, in case they need to read to understand like Cameron. There are 19 lessons in all. They even add math to the equation, so you are getting two subjects in one. I personally liked it! I liked how it taught him about math and science all at the same time. 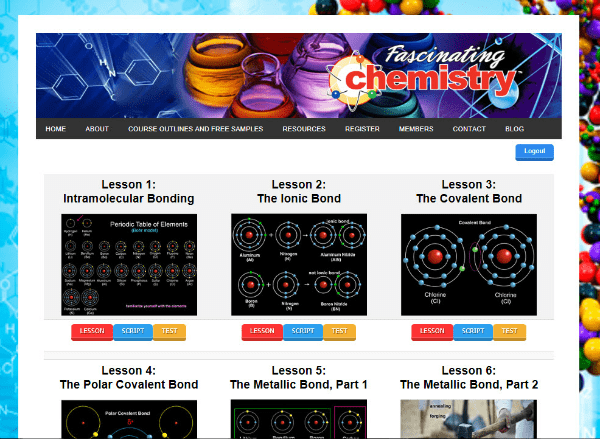 It seemed to be a full online chemistry science curriculum to me, so he could go from the beginning of the school year to the end and learn everything he needed to know. I couldn’t find anything wrong. I usually suggest if they don’t have the lessons written out to do that, but they covered their bases by offering not only videos of the lessons but also Scripts of the lessons, which open up into PDF so they could be printed out if you prefer. Cameron especially liked it because he could watch the video and also have the script open in case he didn’t hear something and he could just find that spot in the script. He has his days where he’d like to just listen or just read, so with this we could do both.